With Spring in full effect and Summer creeping up around the corner, now is the time to bring out all your fun prints and bright colors. This is exactly what consignor 1259 dropped off recently. Take a look at some of the great items in the store now! Striped shorts by store favorite, The Bu & The Duck. New with tags, cropped sweater top by Bit' Z Kids. Adorable, light weight romper by Littl by Lilit. 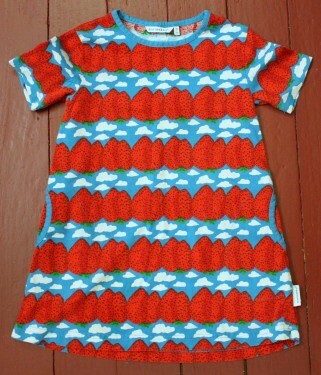 Fun strawberries and clouds print dress by Merimekko. Like new floral dress by Ralph Lauren. Wonderful mustard colored, cropped sweater by Bonpoint. A couple of really cute skirts! Lovely print capri pants by Wheat. Another wonderful piece by The Bu & Duck.